Aspiring commercial integrators and veterans in the space gathered to learn how to unlock profits for their businesses. Guests to this session learned that a combination of competitive offerings, proper training and a focus on the right markets can position them as experts and boost their RMR. Commercial Access Control 101 provided a thorough rundown of how to enter and compete in commercial access control verticals. Experienced peer leaders taught how to train sales staff to sell with RMR every time, price access control services for profitability, develop an internal structure to support access control solutions and determine the right solutions for the right markets. Katz and Lingafelt began with a brief introduction to the basic concepts of access control. From there, the discussion quickly launched into stressing the importance of cloud services. “How are you integrating cloud services as part of your organization’s DNA?” Lingafelt asked the room. He believes a reluctance by service industry professionals to pay for other services often prevents business owners from adopting services that could add value for their customers and improve their RMR. This led him to realize he could offer a service in high demand among his customers, and do so at less cost and hassle for his company. He shared how his team has succeeded with cloud-based offerings, as opposed to on-premise or managed systems. Next on the agenda was to cover some basic installation best practices, and discuss pricing models for access control systems. Katz stressed the importance of being clear with customers about what is being set up in the initial installation, how the system is programmed and coded, and how the credentials will work. The big fish everyone was after, RMR growth, can be supported by a strategic approach that combines these services with an effective internal structure, and applies the strategy to the right markets. According to Katz, choosing the correct vertical market allows a company to become an expert in that market’s needs. “When you focus in on vertical markets as opposed to regions, you’re going to set yourself up as the expert,” Katz said. Properly identifying and gaining experience in a vertical also enables increased efficiency when combined with standardized offerings and processes. Both speakers agreed that creating a platform that works seamlessly and sticking to those solutions can streamline inventory, training, and installations while helping teams become experts on the focused selection of products. Another strategy for success mentioned by the duo was the use of simplified price structures. For example, Lingafelt said his team moved to annual billing because customers were getting annoyed with a small monthly bill. According to Lingafelt, it is also wise to make pricing understood across an organization, so that the customer can get a quote quickly. The final point covered was the importance of clearly defined roles for each team in an organization. Sales teams should not do the engineer’s job, and vice versa. Lingafelt said his organization has focused on letting employees specialize in what they do. “They are crushing it. It’s made us more efficient and effective; our projects are running much smoother,” Lingafelt said of his teams. Management training was also suggested, as many in the room did not claim to prioritize this type of learning. Lingafelt claimed management training is just as important as technical training for unlocking greater effectiveness and, as a result, greater profits. 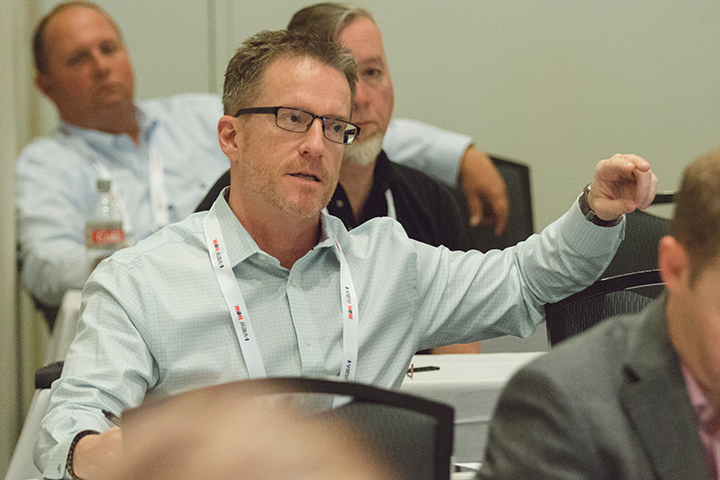 After learning to combine competitive offerings, proper training and a focus on the right markets, attendees left prepared to try new strategies for boosting their presence in the commercial space and growing their RMR.